See in Glossary, replacing the specific animations used but otherwise retaining the original’s structure, parameters and logic. See in Glossary, but with each using different sets of animations. For example, your game may have a variety of NPC types living in the world, but each type (goblin, ogre, elf, etc) has their own unique animations for walking, idling, sitting, etc. 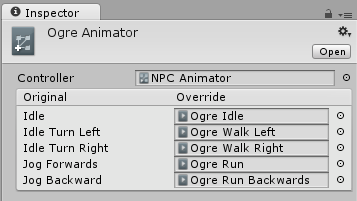 By creating one “base” Animator Controller containing the logic for all NPC types, you could then create an override for each type and drop in their respective animation files. See in Glossary as replacements to the original animation clips. The Ogre may have a different way of idling and moving around, perhaps with slower, heavier and more muscular motion. However, using an Animator Override Controller, the basic logic for how to transistion and blend between movement states can be shared between different characters with different sets of animation, reducing the work required building and modifying state machines themselves. 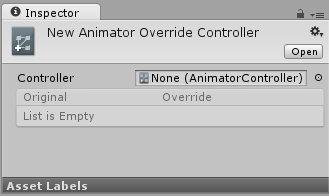 To create a new Animator Override Controller, use the Assets -> Create menu, or the Create button in the Project view, and select Animator Override Controller. You can then assign new animation clips to override the original’s clips. In this example, all the clips have been overridden with the “Ogre” versions of the animation. 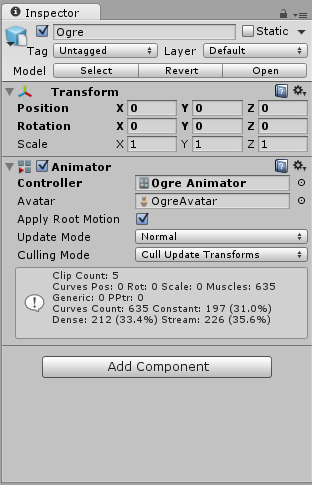 See in Glossary on the Ogre character’s Game Object just as if it was an Animator Controller. It will use the same logic as the original Animator Controller, but play the new animations assigned instead of the originals.